In China, digital tools are bringing gentle warm “breezes” to its booming outbound tourism market. With the Lunar New Year approaching, Chinese visitors are off to a good start as several mini programs within WeChat ecosystem have been launched, putting them at ease by providing efficient online services. As WeChat celebrates its eighth anniversary since public debut, two pieces of news as well came and surprised the millions of Chinese who travel abroad each year. On Jan. 15, multinational insurance firm AXA launched the mini program “AXA Go” to offer end-to-end travel insurance services to Chinese visitors. “AXA Go” provides Chinese travelers with exclusive on-demand access to travel insurance, assistance, and other key travel services before, during and after their trips easily within WeChat. Earlier on Jan. 11, the Global Joint Visa Application Center and WeChat inaugurated the mini program “Breeze Visa” ，allowing users to complete and submit their visa application virtually and pay the fees via WeChat Pay. WeChat Global said that artificial intelligence technology will help identify and integrate users’ documents, ideal for those who don’t bother to manually fill forms; the officially direct access to visa center back-end data will ensure a real-time feedback of the entire process after the visa application is submitted via “Breeze Visa”. These moves, expected to further kindle Chinese affluent middle class’ enthusiasm for traveling abroad, came two weeks ahead of the week-long Lunar New Year holiday. “AXA Go” and “Breeze Visa” stand the part of tech giant Tencent’s global campaign “WeChat Go”. WeChat, nearly omnipresent in China, has long grown from a social messaging app to an open platform connecting over 1 billion monthly active users, tons of devices, industries and businesses. As overseas traveling becomes trendy among the emerging Chinese middle class, WeChat Go is keeping pace by building partnerships with telecom operators, tourist attraction operators, hotel groups, airlines, and other organizations around the world, in a bid to provide Chinese consumers with fast and easy access to information and services that can enhance their travel experience. 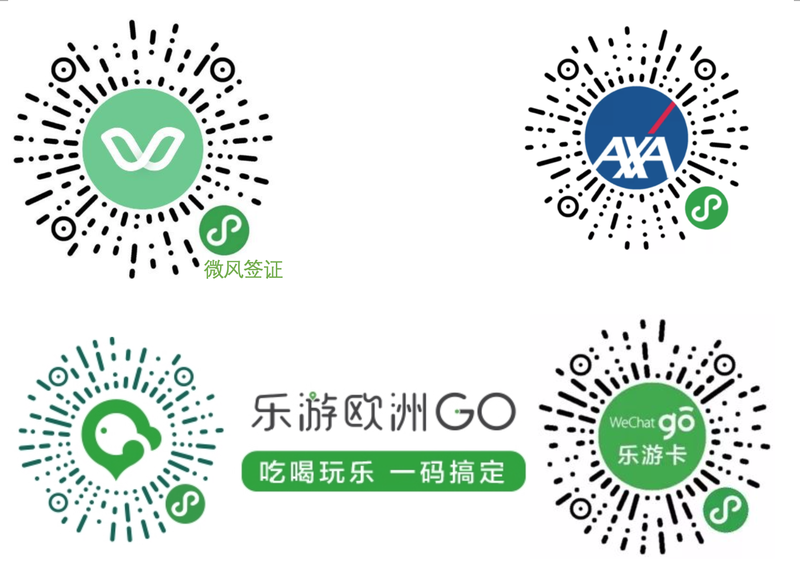 In Europe, the campaign has given birth to WeGoEU – joint-venture between Dutch telecom operator KPN and Chinese Internet company Sunway- which holds a combination of providing connectivity to Chinese travelers – WeChat Go sim-card (微信乐游卡), to serving as a full-fledged virtual travel companion for Chinese free independent travelers- WeChat Go Europe Mini program (乐游欧洲Go). Through the mini program, users are enabled to easily navigate among the best tourist spots, explore the best shopping destinations, as well as the most convenient local transportation options and the best local restaurants, booking for services and purchasing products with all convenience within the social media application they are most familiar with. Launched on 28 March 2018, WeChat Go Europe today is active in 14 cities across 6 countries – The Netherlands, Italy, France, UK, Spain and Germany- and has integrated over 3,000 content, half of which is today bookable directly through WeChat Pay online. WeGoEU also offers restaurants and retailers the possibility to integrate WeChat Pay offline in their shops, adding great convenience to Chinese travelers who can opt to pay with the same easiness and security as they are used to in their home market. All these mini applications are linked with one other, creating a truly WeChat-branded ecosystem serving Chinese outbound travelers, an overall population that exceeded 140 million in 2018. Europe is their second favorite destination, but the numbers are today still below 10 million annual visits. Much could be done to promote Chinese tourism in Europe, including very importantly the review and reform of the visa policy. In recent months, institutions and organizations have been pledging efforts in this direction. A report of the European Travel Commission showed that a full visa liberalization scenario between China and the EU is likely to generate additional inbound spending of €12.5bn per annum and contribute to an increase of Europe’s GDP by 1%. Over 400 million Chinese will travel during the upcoming Chinese Lunar New Year which begins on Feb. 5, among them nearly 7 million will travel abroad, according to a report released by Chinese online travel agency Ctrip. “We hope more ‘breezes’ will blow, we need more joint efforts and digital innovations to bridge Europe and China in what is one of the fastest growing economic sectors of both regions,” said Claudia Vernotti, Director of ChinaEU. Previous PostChinaEU supports promotion event on EU romantic and health SPA tourism in Chengdu, China 中欧数字协会协助将在成都举办的欧中浪漫健康温泉旅游推广活动Next PostSave the date! “Italy-China: Smart Cities & Digital Transformation Dialogue” Rome, 22 March!